PowRyte Elite Recoil Polyurethane (PU) Air Hose transfers air from air compressors to air tools, nailers, staple guns, sprayers and inflation accessories, etc. 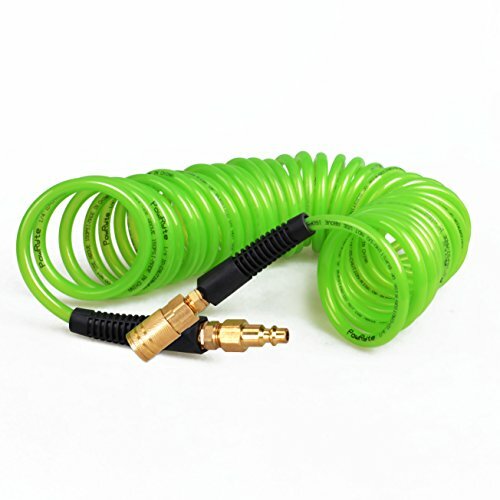 This recoil hose is also called an air compressor hose, compressed air hose, pneumatic air hose or air tool hose. It features self-storing design springs back into coiled shape after each use for better store; The polyurethane construction offers extremely light weight for less user fatigue. It also offers extreme flexibility at temperatures ranging from -30°F to 150°F for all weather use. This polyurethane air hose is resists kinking and abrasion for extended life. It comes equiped two solid brass swivel end fittings reduce hose twist. Bend restrictors reduce wear and tear and prolong the life of the hose. Save Most Live Best. With Eosmos' innovative company structure and advanced native management system, we save your money in every step of our operation, with a guarantee of high-quality and reliability. We deliver the most saving and best value to you. PowRyte Elite's expert product development team guarantees ingenious, innovative, and ergonomically-designed products for serious level DIY workers. PowRyte Elite's products will be necessities that make your life easier and more efficient.